For more than 30 years, PCCI, Inc. has provided sensible solutions to difficult engineering and environmental problems in coastal, ocean, and inland environments. Hands-on experience in environmental planning and protection, marine equipment engineering and fabrication, and ocean project management, has allowed PCCI to deliver intelligent and concrete answers to our client’s most demanding engineering and environmental questions. PCCI, Inc. is a privately owned marine and environmental engineering firm established in 1977. Company headquarters is located in Alexandria, VA, and project offices are in Williamsburg, VA; Ventura, CA; Anchorage, AK; and Honolulu, HI. PCCI specialty services include: Engineering and Installation of Ocean and Waterfront Structures, Ship Salvage Engineering & Marine Environmental Regulatory Compliance. 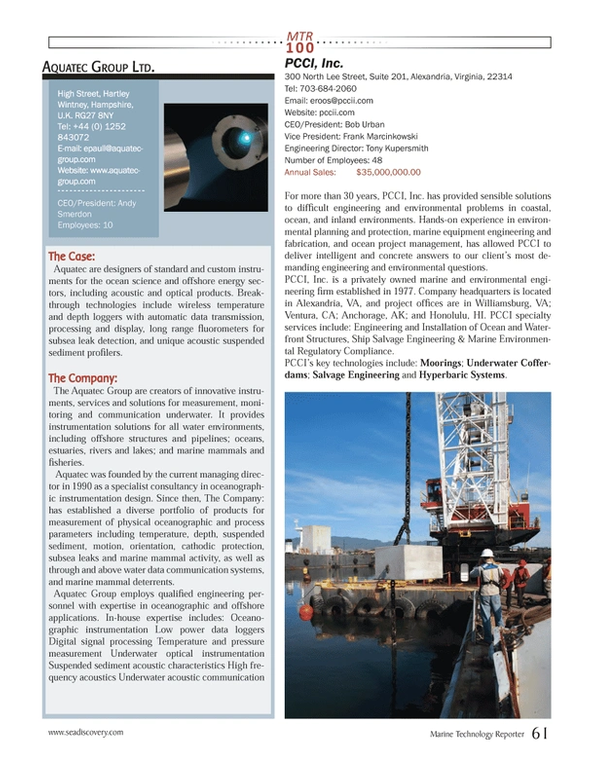 PCCI’s key technologies include: Moorings; Underwater Cofferdams; Salvage Engineering and Hyperbaric Systems.